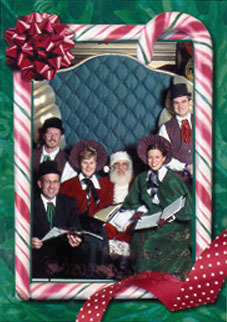 Victorian carolers for your holiday event! Over the past nineteen years, the Merry Christmas Carolers carolers have become a local holiday tradition in the Mansfield/Foxboro Massachusetts area. We help bring the joy of the season to many each year. Adorned in elegant Victorian dress, each a cappella quartet consists of two ladies in lovely capes and period hats accompanied by two gentlemen wearing handsome vests, coats and top hats. Your holiday favorites, both traditional and contemporary, are sung in beautiful four-part harmony. The sights and sounds of a Merry Christmas Carolers quartet are indeed a holiday treat. Whether your event is an intimate family gathering, a large company party, indoors or out, we will help make it a memorable one. Any of the above suggestions can also include a sing-a-long led by the Merry Christmas Carolers. © 2018 JUYP! !, Mansfield, MA.